Hard as it is for me to believe, it’s been almost five weeks since Scout passed away. Her loss has been particularly hard on little Sam but he’s been making a slow recovery and is now nearly back to normal, or perhaps has reached the new normal. Sam loves snuggling on my legs (shown here a few years ago), to the point that if life were a cartoon I’d have permanent Sam-shaped divots on my legs. But after Scout died he’d only sit in my lap tucked up tight against my chest, as though he was huddling against the cold. After a couple of weeks he relaxed a bit and while still in my lap moved a few inches away, and then a few inches more, but he still stays so close that I can’t really work on my laptop. I don’t know if he’ll return to sleeping on my legs or if I’ll have to adapt to his new position on my lap. Sometimes he’ll walk down to where he used to sleep but he’ll turn around and come back, so perhaps it’s just going to take a bit more time. He did go all the way down to my feet the other day, but not unaided. Our dog Ellie was snuggling up next to me as well and suddenly sat up and began licking him in the face. He put up with the indignity for a little while but when it was clear she wasn’t going to stop, he moved down to my feet until the coast was clear when she fell back asleep, and then he came back. His purr has finally returned. It didn’t completely disappear after Scout died, but it got very quiet and hard to come by and didn’t last long. Just in the past few days he’s purred loud and long when we climb into bed at night, so he is definitely recovering. Scout was my near and constant companion so when I’m at home even now her absence is clearly felt. After getting past that initial wall of grief in the days after she died, a shadow of sadness lurks and at unpredictable times I feel her loss most acutely. But that is at it should be, she was one of the best parts of my life. With Sam snuggling too close for me to do much typing on my laptop, I’ve been catching up on a lot of old classic movies and British mysteries, usually with Sam on my lap, Ellie tucked up beside me on my right, with our other cat Emma a few feet to my left in her heated bed. Scout’s heated bed lies empty, and that in and of itself is surprising. Sam loved sleeping in her bed and I assumed after she died he’d take it over as his. But right after she died he’d only occasionally get in, then for a few weeks actively avoided it. Now he’s back to occasionally sleeping in it, but mostly it lies empty. He has been sleeping in Ellie’s beds quite a bit, but that’s not unusual, he’s always done that. Emma has started doing it too, and I had to laugh the other day when both of Ellie’s beds near my office were full of cats and Ellie was scrunched up over on the floor beside them. What a blessing they are, these little ones. 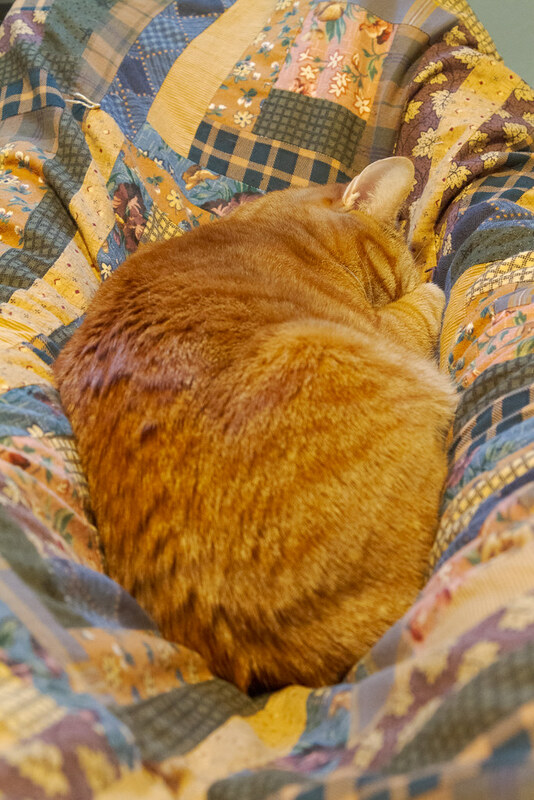 This entry was posted in Pets and tagged blanket, cat, orange tabby, Sam, sleeping, snuggling. Bookmark the permalink.